Last night, I took a break from a stressful week to catch my breath and watch The Little Prince. It seemed like just the sort of fairy tale feature that would rekindle my own storytelling instincts and make me want to… well… make stuff. 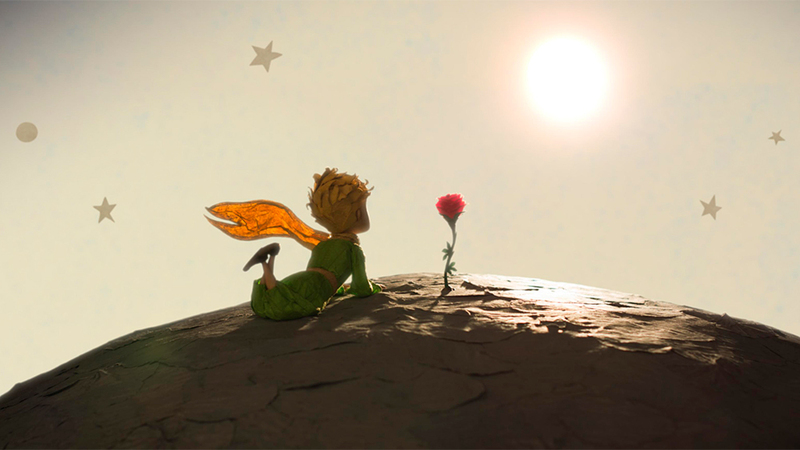 A story within a story — Mark Osborne’s feature-length adaptation of The Little Prince is something old and something new, something beloved and something unexpected. If you’re here to see Antoine de Saint-Exupéry’s cherished short story on the big screen, well… you might want to brace yourself. This isn’t exactly that. There’s a lovely short film adaptation of The Little Prince here — one animated with breathtaking delicacy, the characters sculpted out of what often seems to be translucent paper. The colors, the textures, the lines, the blessed imperfections: It seems unlike anything I’ve ever seen in animation before. I wanted it to go on forever. But that short film, which I’d really like to see on its own someday, has been scissored up and scattered throughout a much more ambitious narrative. It’s a story being read and pondered by the protagonist of a much more conventional animated adventure. It’s easy to feel sorry for the little girl (voiced by Mackenzie Foy). She suffers from the increasingly manic over-parenting of a control-freak mother (Rachel McAdams), whose all-consuming “life plan” for her is manifested in a labyrinthine chart full of magnets and checkboxes. And it’s easy to root for that unlikely mentor nextdoor: the half-senile (?) adventurer called “The Aviator,” whose flights of fancy keep getting him in trouble with local police. We can see right away that he’s the countercultural friend who can save her from a mechanistic, deterministic existence. Why not set up the movie this way? 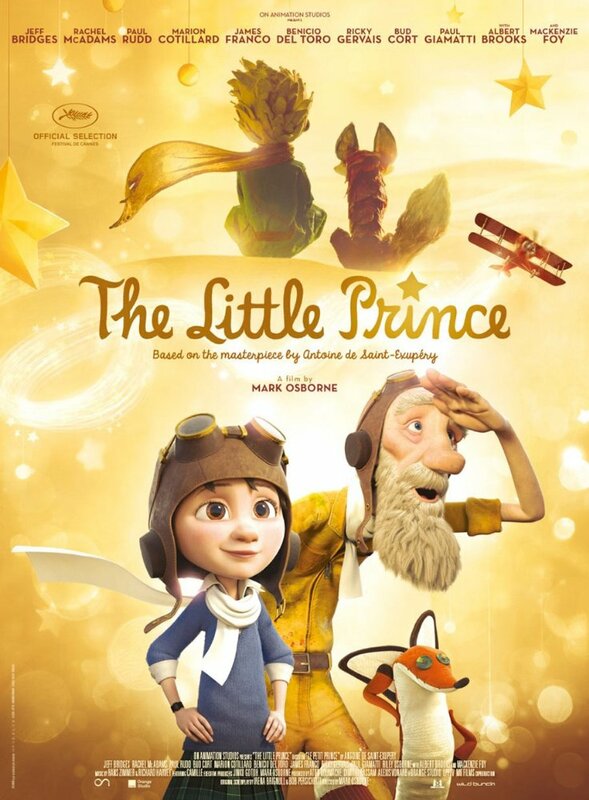 Why not have The Little Prince be a story that shows this unlucky little girl a way to escape her living nightmare? But when the new narrative takes a dark and Gilliam-esque turn halfway through the film, well… that gem-like story by Antoine de Saint-Exupéry begins to suffer like a rose wilting in a storm of activity. We end up sucked into a bizarre and overlong hybrid of Up, Brazil, and last year’s animated version of Kahlil Ghibran’s The Prophet. Here’s the problem: The Little Prince is an enchanting fantasy. It should never have to compete with a second narrative that becomes a bigger, wilder, stranger fantasy. And as the adventure becomes louder and more hysterical in its eagerness to generate suspense and explosions, it somehow becomes both schizophrenic and conventional. It’s as if several screenwriters decided to use all the ideas instead of just the best ones. The movie stirs up so many cliches, so many incongruous tones, and so many new ideas that it gets disorienting. I began checking my watch, my suspension of disbelief spoiled, more than 30 minutes before the movie ended. I just wanted to withdraw to a comfy chair with a copy of the original storybook, to bask in its delicate magic and quiet spirit. Still — Jeff Bridges does some beautiful voice work here. He makes the Aviator a gentle and lovable character. Several years ago, the part probably would have gone to Robin Williams, and we would have ended up with someone almost intolerably wacky. So long as Bridges’ sticky-as-taffy line delivery is giving tactile personality to the scenes, this film is as much a pleasure to listen to as it is to watch. So, sure: Queue up The Little Prince on Netflix and watch it with the kids. It’s a film with a multiple-personalities disorder, but some of those personalities are worth your time. And if you love the original story, I can tell you right now which parts of the movie you’ll love best. The Gilliam film I was reminded of most was The Adventures of Baron Munchhausen: the visits to other worlds, the legendary hero who has abandoned (and maybe even forgotten) his fantastical past, etc. As someone who never knew the original story (I know, scandalous) I found the movie quite delightful. The colorful animation was glorious. The moral of the film was one I was delighted to share with my grandchildren. Surely you are not one of those people who judge a movie based on a book by how adherent the screenplay is to the original story? (Grin) Love your blog BTW.